To follow up the huge success of the 2016 Street Art Explosion, Adelaide Fringe is again handing out art grants to street artists throughout the state. Jimmy C, a world renowned street artist is one of the Fringe’s ambassadors and is heading this event to encourage mural painting all over his hometown. Jack Fran has been smashing out huge scale murals in both Kilburn and in Warradale. Fran’s work is highly expressive and brings new striking style of art to our city of already brilliant portrait based murals. His piece on the Kilburn Community Centre is now completed; the cool colour palette contrasting against the powerful expressions makes the building pop amongst dull grey neighbouring buildings. Fran’s newest piece just opposite The Warradale Hotel is currently underway and is his largest mural to date covering 450 square metres. His masterful work on the women’s facial expression draws attention from a giant area, the addition of pattern and a second figure will only bolster this gargantuan display of street art. Central to this year’s Street Art Explosion, Chesser Lane has been covered with the iconic work of Jimmy C, Seb Humphries, Elizabeth Close, Mimby Jones Robinson and Aurelia Carbone. The left mural by Jimmy C and Humphries is undoubtably the standout mural of this year’s Street Art Explosion. The two world famous techniques work effortlessly together and function as an effective piece to grab the attention of the public. Beside it, Elizabeth Close specialises in contemporary Aboriginal artwork and scored an entire section of wall for her piece. Working with only black and white she utilises repetition and fluid line work to guide the eye up and down, giving an organic quality to the mural. Mimby Jones Robinson creates beautiful character work full of vibrant colour, teaming up with Aurelia Carbone, the two create a stunning wall featuring strong focal points. 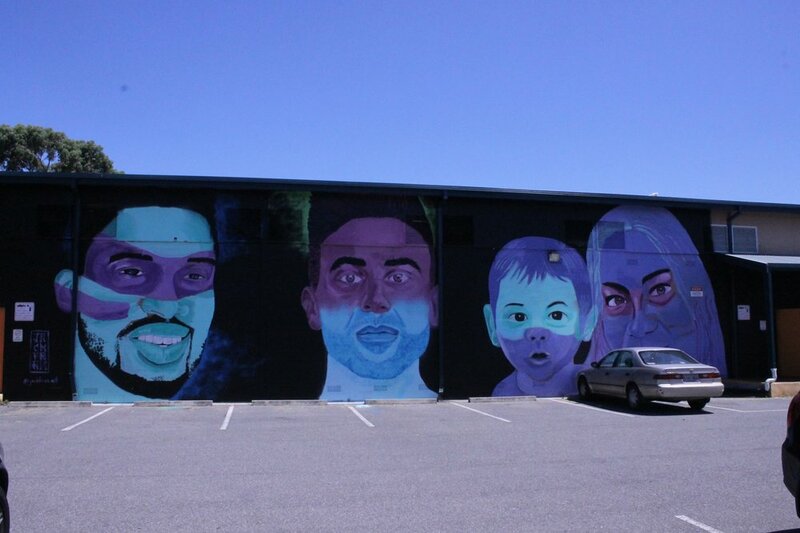 Robinson is currently underway working on a second mural on the Playford Civic Centre in Elizabeth. On the West End of town, an old Beyond Killa mural has been given a fresh coat of paint by Kenyan street artist, Bankslave. Commissioned by Mama Jambo, his artwork adds to the otherwise industrial facade of the African restaurant. To accompany the stunning piece by Bankslave, Kenyan artist Douglas Hihiko has covered a giant area of wall with graffiti inspired scenery and personally one of my favourite character works on the West End of town. His muted colour choices integrate perfectly with the surrounding warehouse buildings. Wrapping up the first week of 2017’s Street Art Explosion, Vans the Omega has worked with Splash Adelaide and a few small bars in Adelaide to bring a second mural to Gresham Street. His highly detailed aerosol work paired with his abstract use of shape and colour gives a very strong personality to the previously boring grey alley. In just a single week of this year’s Street Art Explosion, a handful of extremely talented artists have worked tirelessly to build on our thriving street art scene. A digital map of these pieces and more to come are on the Fringe website, visit one of many Fringe ticket offices through Adelaide for a physical map.